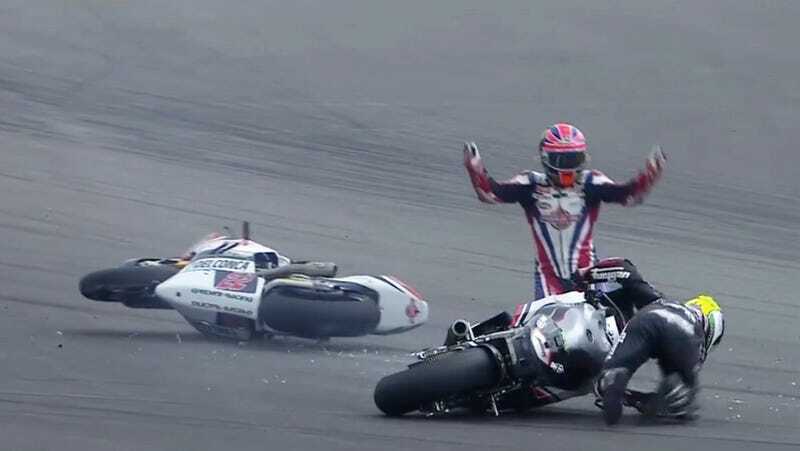 The first day of practice at this year’s MalaysianGP did not go great for British rider Sam Lowes, who wiped out in turn 14, got back on the track and immediately got wrecked up by another rider. The guy was just not meant to get around that corner. MotoGP, Moto2 and Moto3 racers ran two days of “free practice” at the Sepang International Circuit leading up to Round 17 of this year’s MotoGP championship, which will go down at the track on Oct. 30. Lowes did not place in this practice session, with a best lap of 2:28.207, but he got back on the horse (again) the next day and was the ninth-fastest Moto2 rider on the second free practice day with a 2:09.802 lap according to Crash.net. I’m no professional racer, but Lowes’ re-entry to the race track after crashing here looks a little wonky to me. He doesn’t seem to check for inbound traffic at all as he casually gets back up to speed mid-turn before being wiped out by Johann Zarco, who’s already crashing himself as he comes into frame. 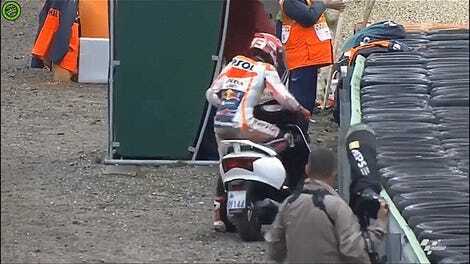 Though Zarco’s crash could be the result of him panicking upon seeing a slow-moving motorcyclist in his path. Interestingly, Lowes and Zarco seem to have history together—Zarco also wrecked Lowes last month at another race in England. The Daily Star indicates Lowes wasn’t too happy about it, and I doubt this incident did much to improve their friendship. Autosport reports that Zarco won the Moto2 race on Sunday and and secured the championship title, while the Moto2 race standings list Lowes as unclassified and 18 laps down. According to the beIN website, that finish was due to another wipeout early on.